Like so many successful digital companies, Yoast felt they knew enough about doing business online to manage their own sales and conversion strategy. And why not? After all, they are the creators of the number 1 SEO plugin for WordPress. But then they hired us. The result: we doubled their revenue without spending anything on advertising. It’s astonishing what we’ve accomplished in so little time. Not only have our sales increased like never before, we also feel like we now have our own CRO department. Which we love! Yoast is most famous for its WordPress plugin, which comes in a free version as well as a Premium one. The plug-in is used on more than 5 million websites worldwide. 83% more transactions and 118% more revenue. By optimizing their website and copy based on user research and ab-testing. Without spending anything on advertising. Yoast had one product page for their Yoast SEO WordPress plugin. That sounds logical, doesn’t it? But using one and the same page to target different kinds of visitors isn’t always the best strategy. That’s why we made different landing pages (with different copy) for people in these different stages of awareness. And because we adapted the message to their needs and situation, this resulted in both more sales and more downloads. Our user research also revealed that some visitors didn’t understand the differences between the free and the Premium version of the SEO plugin. The advantages of the Premium version weren’t very clear to a lot of people. Compare this with real life. If you ask a bad salesperson a question, often they just read out the packaging to you. (We’ve all been there.) A good salesperson knows their product range inside out, asks you the right questions and guides you to the best solution for you. Of course we didn’t just blindly change the page, cross our fingers and hoped for the best. We AB-tested several versions and are in fact still tweaking the page. Because there’s always room for improvement. 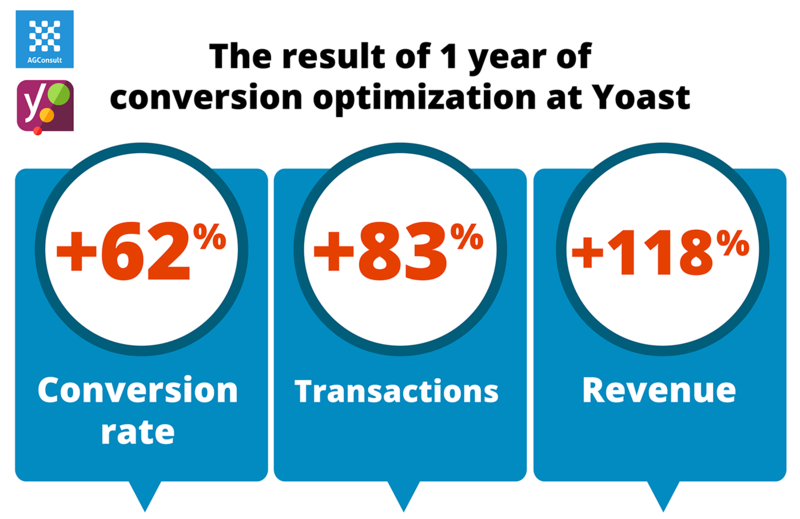 After only 3 months of working together, Yoast had their best month ever in terms of sales. Yoast with ‘their own conversion department’ at YoastCon, November 2nd, 2017. From left to right: Michiel, Marieke, Joost, Liesa, Joey, Davy, Jip and Annelieke. Why do we get such good results at Yoast? I guess some of you might think that the Yoast website probably sucked when we started working for them. Davy: “Based on in-depth user research we propose variations and tests. The good thing about Yoast is that they don’t have 18 committees and 4 management levels that want to give feedback and give their blessing. At Yoast we show the tests and put them live. And winners are implemented by Yoast immediately. That means we can test and go forward at a very nice speed. Some of our other clients need the same time just to see when they can have a meeting to discuss the variation. Would you like to be more successful in 2019?